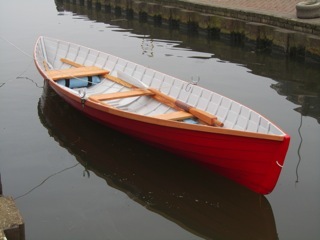 Relying on John Gardner’s book, Building Classic Small Craft, Bill Aylward built this Herreshoff rowboat he calls RED. 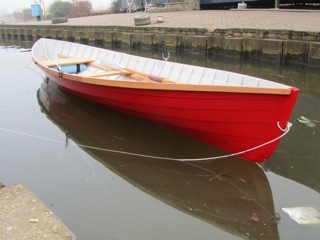 He spent much of 2012 building the boat, launching her in 2013. Bill made the planking from okoume plywood and everything else from Douglas-fir. He tweaked the 16′6″ design by adding an inch to the sheer at the bow. 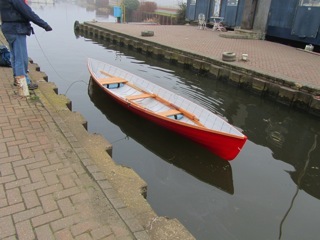 Bill sails his Beachcomber-Alpha in the summer on the Humber River; he’ll row this boat on the Aire and Calder Canal yearround. Bill hails from West Yorkshire where he took this photographs. 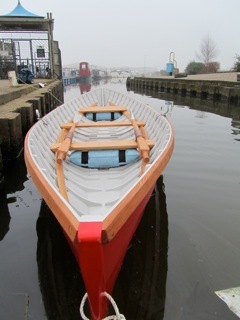 He writes that this is still and industrially important canal and it was a foggy day so the scenes reflect very well what used to be the grimy and gritty north of England. 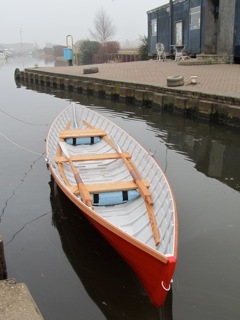 You can buy John Gardner’s book at The WoodenBoat Store.